A plaque commemorating a Welsh army victory more than 800 years ago has been unveiled. 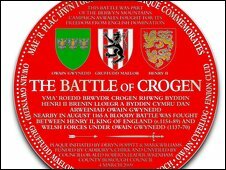 The battle of Crogen saw Owain Gwynedd, a prince who ruled over a large part of north Wales, defeat the forces of Henry II in 1165. The plaque was unveiled by Wrexham council's leader Aled Roberts at Castle Mill Bridge, near Chirk Castle. It is hoped a heritage trail around the scene of the battle will also be developed. The plaque is the result of two local historians, Deryn Poppitt and Mark Williams, who researched the battle and wanted a permanent memorial. Cadbury's, which has a factory in Chirk, has paid for the £1,600 plaque. The project has also been supported by Northern Marches Cymru, which aims to help local heritage projects. The organisation is now confident it it can contribute towards extending the project through the Rural Development Plan for Wales, which is funded by the Welsh Assembly Government and the European Union. Karen Harris, community heritage officer with Northern Marches Cymru, said: "We have recently been speaking to Guy Myddleton of Chirk Castle who has very kindly agreed to allow land to be used for further interpretation of the site. "This will give people a vision of the battle that took place and stress not just the importance of local history but also help give Wrexham a true sense of place within the wider context of the history of Wales." She said she hoped a trail could be created which could easily link up with the nearby Offa's Dyke trail. She added: "It's a fantastic site for people to visit, in the Ceiriog Valley. You look out over the battlefield and it's the backdrop to Chirk Castle. "Dare I say it, there could even be a statue of Owain Gwynedd one day and he could point across the battlefield." 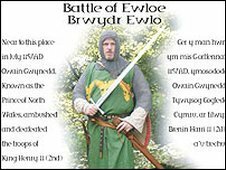 In 2008, a plaque commemorating the relatively unknown battle of Ewloe in 1157 was unveiled in Ewloe Wood in Flintshire. The battle saw 200 Welshmen, led by Owain Gwynedd, nearly kill Henry II.